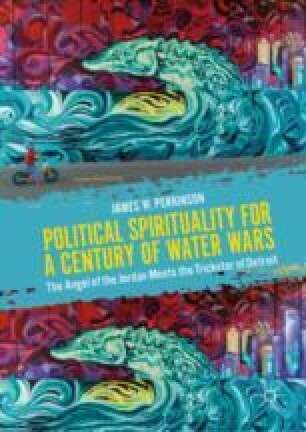 Continuing the probe of water-ford politics and East bank numinosity, Chapter 8 tracks the Bedouin-trained Baptizer’s itinerary on either side of the Jordan—reinvigorating the Elijah tradition and throwing down a gauntlet to Roman and Jewish elite practices of reengineering water in service of urban bathhouse lifestyles at peasant expense. It will probe Jesus’ furtive lake-crossings, invoking Jonah as sign and offering fish as “saving” food, and culminate in his gender-bending Succoth challenge, as Wisdom incarnate, in John’s gospel, countering Temple-State claims to guarantee field-fertility through tax policy, with an older understanding of rain as wild bounty and water as “living” gift. Anthes, Emily. 2014. When Fish Shout. The New Yorker, November 10. Viewed June 15, 2018, https://www.newyorker.com/tech/elements/when-fish-shout. Arrows, Four. 2018. Four Arrows: An Indigenous Take on the #MeToo Movement. OpEdNews, Podcast February 21, 2018 at 17:42:56. Viewed October 25, 2018, https://www.opednews.com/Podcast/Four-Arrows-An-Indigenous-by-Rob-Kall-metoo_Bottom-up_Bottom-up-Top-Down_Civilization-180221-674.html. Carrington, Damian. 2018. Humans Just 0.01% of All Life But Have Destroyed 83% of Wild Mammals—Study. The Guardian, May 21. Viewed June 14, 2018, https://www.theguardian.com/environment/2018/may/21/human-race-just-001-of-all-life-but-has-destroyed-over-80-of-wild-mammals-study. Ewing, W. 1915. Bethsaida. In International Standard Bible Encyclopedia, ed. J. Orr, vol. IV, 1187–1188. Viewed June 15, 2018, http://archive.hundewadt.dk/dvd-the-bibles-fight-to-live/003%20Text/005%20Bible%20Reference%20Works/International%20Standard%20Bible%20Encyclopedia%20%20(James%20Orr).pdf. Hamel, Gildas. 2014. Taking the Argo to Nineveh: Jonah and Jason in a Mediterranean Context. Slightly revised version of 1995 Judaism article. Viewed April 22, 2018, https://cpb-us-e1.wpmucdn.com/sites.ucsc.edu/dist/9/20/files/2015/06/Jonah.pdf. Herodotus, Histories I.23-24, ed. A.D. Godley. Viewed June 15, 2018, http://www.perseus.tufts.edu/hopper/text?doc=Perseus%3Atext%3A1999.01.0126%3Abook%3D1%3Achapter%3D23%3Asection%3D1. Jarvis, Brooke. 2018. The Insect Apocalypse Is Here. New York Times, November 27, 2018. Viewed January 20, 2019, https://www.nytimes.com/2018/11/27/magazine/insect-apocalypse.html. Kaplan, Aryeh. 1993. The Living Torah and Nach. Trumah-Exodus-Chapter 25:5 ftnt. Viewed June 15, 2018, http://www.conservapedia.com/The_Ta%E1%B8%A5ash_(legendary_animal), http://www.bible.ort.org/books/pentd2.asp?ACTION=displaypage&BOOK=2&CHAPTER=25#C1533. Keith, Lierre. 2011. Why Vegetarianism Will Not Save the World. Interview by Ian MacKenzie, Matador Network, http://matadornetwork.com/bnt/why-vegetarianism-will-not-save-the-world/. Laney, J. Carl. 1977. “The Identification of Bethany Beyond the Jordan” from Selective Geographical Problems in the Life of Christ (doctoral dissertation at Dallas Theological Seminary), http://www.bibleplaces.com/Identification_of_Bethany_Beyond_the_Jordan,_by_J_CarlLaney.pdf,16. ———. 2014. “Elijah as the Archetypal wilderness Prophet (Talk at Wild Goose Festival; see also, recorded Webinar, “Elijah and the Wilderness Prophetic Tradition”), http://www.chedmyers.org/catalog/ecology-faith. Prechtel, Martín (Interview by Derrick Jensen). 2001. Saving the Indigenous Soul: An Interview with Martin Prechtel. The Sun Magazine, April. Viewed June 14, 2018, http://www.thesunmagazine.org/issues/304/saving_the_indigenous_soul. ScienceAlert (BEC Crew). 2016. Fish Have Been Recorded Singing a Dawn Chorus—Just Like Birds. University of Sydney Marine Studies Institute, September 23, 2016. Viewed June 15, 2018, https://www.sciencealert.com/fish-have-been-recorded-singing-a-dawn-chorus-just-like-birds. Solomon, Norman. 2017. What Was the Tachash Covering the Tabernacle? The Torah: A Historical and Contextual Approach, posted January 24, 2017. Viewed June 14, 2018, https://thetorah.com/what-was-the-tachash-covering-the-tabernacle/. Stinehart, Jim. 2008. What Does ‘Beth Shan’ Mean? http://lists.ibiblio.org/pipermail/b-hebrew/2008-November/036540.html. Tabor, James. 2012a. A ‘Jesus Hideout’ in Jordan, http://jamestabor.com/2012/06/24/a-jesus-hideout-in-jordan/. ———. 2012b. Did John the Baptist Eat Bugs, Beans, or Pancakes? http://jamestabor.com/2012/09/02/did-john-the-baptist-eat-bugs/. Wooley, Liz (and Movement Generation Justice and Ecology Project). 2016. Remembering and Realigning the Economy to the Bioregion: The Example of ‘The Salmon Nation’. From Banks and Tanks to Cooperation and Caring: A Strategic Framework for a Just Transition. Viewed June 15, 2018, http://movementgeneration.org/wpcontent/uploads/2016/11/JT_booklet_English_SPREADs_web.pdf.